Two new Muppet characters were making their debut in Season Four: SAM the Robot and Count von Count. Both took advantage of virtuoso performer Jerry Nelson’s return to the Muppets after taking a break to attend to family matters. He performed both characters – SAM lasted only a short time, but the Count continues today, forty years later. The giant Snuffle-upagus was returning after debuting the year before. The human cast was changing, too. A new actor, known for his Shakespearean theater work, Harold Miller, would play Gordon, and singer/songwriter Malvina Reynolds was joining the gang as Kate. Perhaps most indicative of the show’s widespread success was the spread to other countries. Sesame Street was taking Latin America by storm with Plaza Sesamo, produced in Mexico that year in Spanish and Vila Sesame, created in Sao Paulo in Brazilian Portuguese. Sesamstrasse, the German language version, would premiere in January 1973. Learn more about the creation of SAM the Robot. 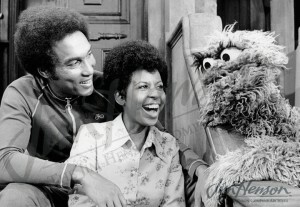 Harold Miller playing Gordon with Loretta Long (playing Susan) and Oscar, on Sesame Street - Season Four, 1972/73. 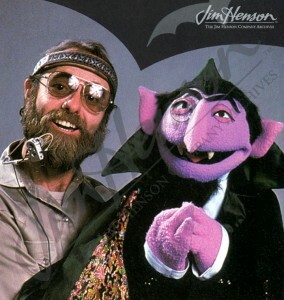 Jerry Nelson and the Count von Count of Sesame Street. This entry was posted in 08-August '72, 1972, Sesame Street and tagged Gordon, Harold Miller, Jerry Nelson, Jon Stone, Malvina Reynolds, Muppets, Plaza Sesamo, Sam the Robot, Sesamstrasse, Snuffle-upagus, Vila Sesame. Bookmark the permalink.